Thanks for your willingness to help with the May 18, 2019 Bellevue Community Picnic! This year's event is going to be bigger and better than ever and will be held at the recreational field behind Bellevue Middle School at 655 Colice Jeanne Rd., Nashville TN 37221. 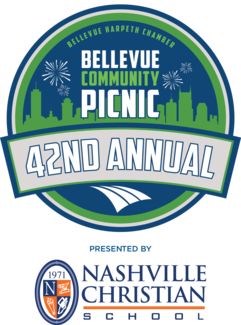 When you arrive, you will check in at the Bellevue Harpeth Chamber of Commerce tent, which will be located at the corner of the field nearest the Church of Christ parking lot. Also, as a token of our appreciation, all volunteers will receive a $7 food truck voucher, a token for a free lemonade at Nashville Squeeze's vendor space, and two free "At Home in Bellevue" prints on the day of the picnic. If you have any questions about volunteering, please feel free to email or text me before you sign up. Thanks in advance!